FSA (Full Speed Ahead) is well known for making fancy carbon components for your bike. However, sometimes you’ll come across something special and a hidden gem amongst the multitude of carbon components on the market these days. FSA has a hidden gem with the Energy line of products using aluminum and titanium parts for a surprisingly high end product that is actually lighter and stiffer than most products that are at a higher price point and the FSA Energy line is less expensive, as well. 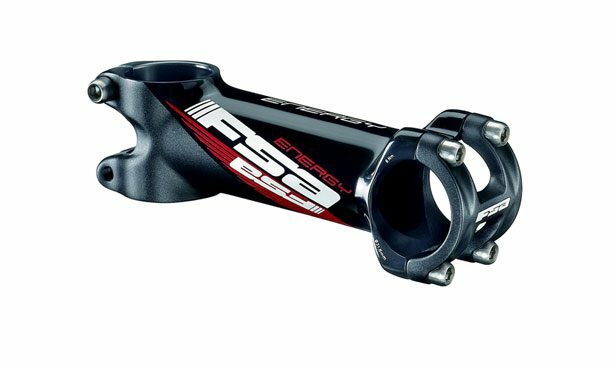 The FSA Energy stem is 3D forged and CNC machined from AL2014. The Energy stem has six titanium bolts through out the stem to reduce weight and a four bolt sculpted face to further reduce weight. TheSoCalCycling.com Team has been using the FSA Energy stem with great success for the 2014 and 2015 seasons. This stem is incredibly stiff for its weight which offer minimal flex. The graphics are solid as well and they come with a sand blasted and polished black aluminum red/white/black graphic scheme to go nicely with most bikes. Please visit FullSpeedAhead.com for more information and to find an authorized dealer near you.